To keep patients feeling their best, Woodstown Physical Therapy & Sports Rehab offers a diverse selection of treatments to help the body restore itself. This breakthrough treatment uses the body’s own survival mechanism to restore normal physical functions as well as provide pain relief. 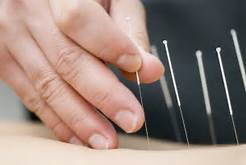 Known for its anti-inflammatory effects, dry needling normalized the immune, endocrine and cardiovascular system. Woodstown Physical Therapy will often incorporate other forms of hands-on treatments with dry needling to best suit the patient’s needs. Techniques such as, laser treatments, electrical stimulation, or myofascial release are incorporated to maximize results and patient outcomes. Dry needling can be used to treat back or neck pain, frozen shoulders, tennis elbow, muscle spasms, hip or knee pain or strain injuries. Because of the versatility of this treatment, dry needling can also be used as a preventive measure against injury or strain. Find out how Dry Needling can help you.